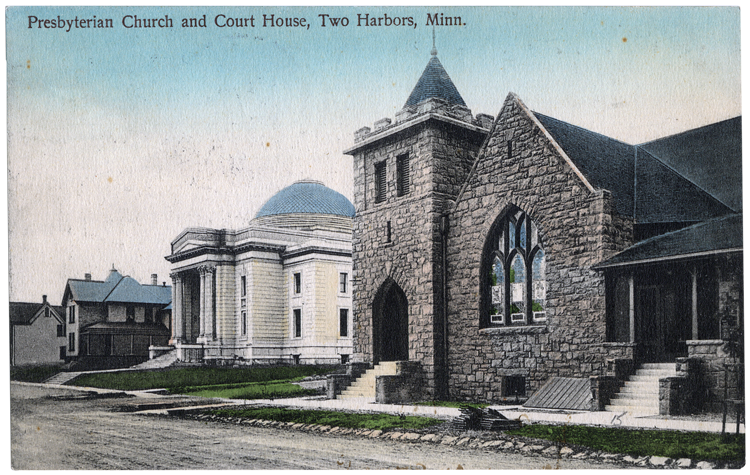 Found just across the street from the Lake County Courthouse at 531 Third Avenue, Two Harbors’ First Presbyterian Church has stood since 1906. The original 1887 church (pastored by the Reverend J. N. Johnstone) was a simple frame structure, but its congregation’s rapid growth made the building obsolete by 1900. Church leaders, including the pastor, Reverend J. A. McGaughey, called on Duluth architects Fredrick German and A. Werner Lignel to design a building in the English Gothic style. Two Harbors contractors Gustafson and Strom constructed the building using red brownstone quarried near Port Wing, Wisconsin, and brought to Two Harbors on barges from Lake Superior’s south shore. The building included a parapeted corner tower with a pyramid roof; that roof, unfortunately, is no longer part of the structure. Inside the church, a slanted floor and curved wooden pews provide parishioners a theatre-like view of the altar. All but one of the building’s stained-glass windows commemorate early parishioners; a lone panel was donated by local sailors in honor of thirty-three men who lost their lives during the storm of November 28, 1905. The church once had a pipe organ that, story has it, only worked when the furnace was in operation. Over the years the church joined with Two Harbors’ First Methodist Episcopal Church, the Swedish Methodist Episcopal Church, and the Clover Valley Presbyterian Church. In 1969 it joined with the Methodist Church and became the United Church of Two Harbors.